The main function of the digestive system of animals is to digest food, absorb nutrients, and eliminate indigestible materials from the body. Cow is an herbivore who only eats plant materials. Human is an omnivore who eats both animal as well as the plant materials. The digestive system of cow and human comprises teeth, mouth, esophagus, stomach, small and large intestine. The main difference between cow and human digestive system is that cow exhibits a foregut fermenter digestion whereas human exhibits a simple monogastric digestion. Both digestive systems also differ by the type of teeth, mouth, stomach, gut, and digestive enzymes secreted by the gut. Since cow is an herbivore, the digestive system of a cow is longer than the digestive system a human as well. Cow digestive system refers to the organ system of cows where the digestion of plant materials occurs. A cow has 32 teeth in the bottom jaw; 8 incisors and 24 premolars and molars. The top jaw of a cow does not have teeth in the front but a hard pad of skin, which is called the dental pad, is present. A cow has four stomachs: rumen, reticulum, omasum, and abomasum. The first three stomachs, the rumen, reticulum, and omasum are involved in the breaking down of plant fibers. The population of microflora is involved in this process. It breaks down cellulose through fermentation, producing volatile fatty acids such as acetate, butyrate, and propionate. These fatty acids are utilized by the cow as a nutrient. Digestive enzymes are secreted in the fourth stomach called the abomasum. Therefore, fermentation occurs before the digestion of food in cows. Hence, this process is called foregut fermentation. The process of digestion in cow and human is shown in figure 1. Cows further chew the partly digested food or cud returned from the first stomach. Therefore, they are called ruminants. Sheep, antelopes, deer, and giraffes are also ruminants. Small intestine and the large intestine of cows are more similar to the human digestive system. However, cows have a large caecum, further digesting the fibers. Human digestive system refers to the organ system in which the digestion of food, absorption of nutrients, and the elimination of wastes occur in humans. Humans also have 32 teeth in the mouth, which break down large food particles into small particles. The chewing mixes those particles with the saliva, producing food bolus. Carbohydrate digestion starts at the mouth by the digestive enzymes in the saliva. Mouth is connected to the esophagus through the pharynx. Esophagus transfers food to the stomach. Humans have a single stomach in which the actual digestion of food is taken place. Protein digestion occurs in the stomach. The human digestive system is shown in figure 2. The small intestine absorbs most of the nutrients such as glucose, amino acids, fatty acids, nucleotides. The large intestine absorbs water from the indigestible materials. Both cow and human digestive system are involved in the digestion of food, absorption of nutrients, and elimination of indigestible materials. The digestive system of cow and human comprises teeth, mouth, esophagus, stomach, small and a large intestine. Both cow and human contain 32 teeth. Both cow and human digestive systems are capable of digesting plant materials. Cow Digestive System: Cow digestive system is the organ system of cows where the digestion of plant materials occur. Human Digestive System: Human digestive system is the organ system in which the digestion of food, absorption of nutrients, and elimination of wastes occur. Cow Digestive System: Cows are herbivores who eat plant materials. Human Digestive System: Humans are omnivores who eat both plant and animal materials. Cow Digestive System: The digestive system of cows is long. Human Digestive System: The digestive system of humans is shorter than that of a cow. Cow Digestive System: The digestive system of cows lack enzymes to digest proteins. Human Digestive System: The digestive system of human contains enzymes to digest proteins. Cow Digestive System: Cows have two, blunt canines. Human Digestive System: Human have four, sharp canines. Cow Digestive System: Premolars and molars of cow show lateral movement. Human Digestive System: Premolars and molars of human show vertical movement. Cow Digestive System: Cows produce 65 liters of saliva per day. 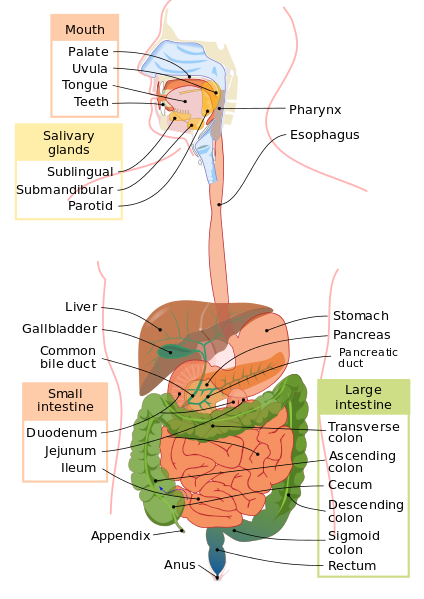 Human Digestive System: Humans produces 1-1.5 liters of saliva per day. Cow Digestive System: The saliva of cows lacks digestive enzymes. Human Digestive System: The saliva of human contains carbohydrate digestive enzymes. Cow Digestive System: Cows perform regurgitation during digestion. Human Digestive System: Humans have no regurgitation. Cow Digestive System: Cows have a complex rumen. Human Digestive System: Humans have a simple stomach. Cow Digestive System: Cows have four stomachs. Human Digestive System: Humans have a single stomach. Cow Digestive System: Cows liver weighs more than the human liver. Human Digestive System: Human liver weighs about 1.5 kg. Cow Digestive System: The small intestine of a cow is 46 m long. Human Digestive System: The small intestine of human is 6.1 m long. Cow Digestive System: The colon of a cow is 11 m long. Human Digestive System: The colon of human is 5-6 m long. Cow and human digestive system perform a similar function. However, based on the type of diet of each animal, the anatomy of the digestive system varies. Cows are herbivores, eating plant materials while humans are omnivores, eating both plant and animal materials. Plant materials are difficult to digest and take time. Therefore, cow’s digestive system is longer than that of the humans. Their teeth, stomach as well as digestive enzymes differ from each other. Therefore, the main difference between cow and human digestive system is their anatomy. 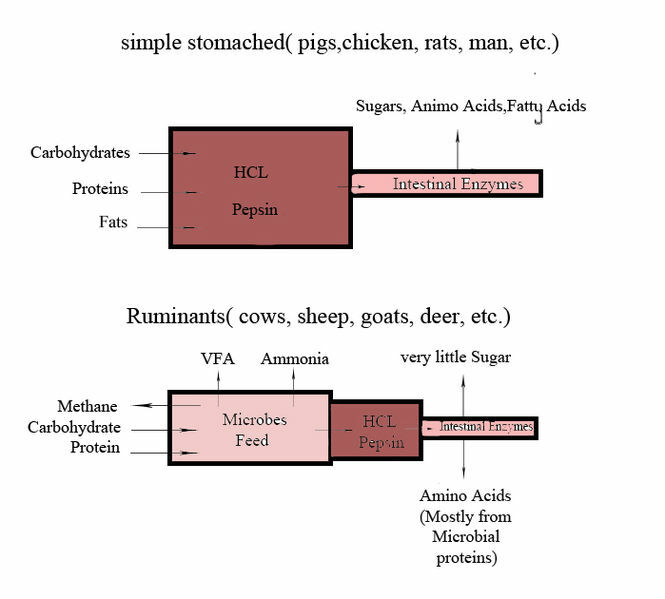 1.“Feeding the dairy herd.” Ruminant anatomy and physiology : Dairy Extension : University of Minnesota Extension, Available here. 2.”Human Digestive System.”EnchantedLearning.Com, Available here.